Six innings, five runs, eight hits. For Tim Lincecum and his now-10.54 ERA, that qualifies as an improvement. The guy who might’ve been the best pitcher on the planet three years ago now makes his fantasy owners cower in terror before checking his box scores. Which is exactly why you should be targeting him. For all the hand-wringing over Lincecum’s lower velocity, the fact is he’s been a low-90s fastball guy for years now. He’s striking out more than a batter an inning, with four times as many Ks and walks, and a slow start that might be nothing more than some very curable location issues. some of those ugly beginnings ended in greatness. MVP and Cy Young greatness. The biggest lesson purveyor here was Wills. Though no one tracked batting average on balls in play 50 years ago, it’s likely that Wills got hammered by the BABIP monster, given he possessed blazing speed and struck out just six times in his first 20 games in ’62, yet hit just .241/.304/.325 in that time. Wills’s bad hitting luck and resulting low on-base percentage limited his stolen-base chances, resulting in a total of eight steals in 20 games (a pace of 65 over a 162-game season). By year’s end, Wills’s luck had returned, netting a line of .299/.347/.373, with 130 runs scored and a new 20th-century single-season record of 104 steals. One of the most prolific ground-ball pitchers and stingiest home run allowers of his generation, Halladay got torched by the long ball at the start of the 2003 season, throwing the rest of his numbers out of whack. Through April of that year, more than one-quarter of the fly balls Halladay allowed left the park (a rate more than twice as high as league average), fueling a near-5.00 ERA. That number plunged from there, which combined with Halladay’s impeccable command (1.1 walks per nine innings, second-lowest mark in MLB) and durability (a major league-high 266 innings pitched) made Doc the most valuable pitcher in the majors that year, both by WAR and by AL Cy Young voting. Locking in on abnormally low batting averages on balls in play for hitters (league average last year was .291) and abnormally high HR/FB rates for pitchers (league average last year was 9.7 percent), then, could create some early buying opportunities. On the pitching side, top names like Dan Haren (18.8%, 6.97 ERA) and CC Sabathia (16.7%, 6.75 ERA) could be in line for some positive regression. Next-class-down pitchers with similar potential include Daniel Hudson (33.3% HR/FB, 8.71 ERA) and Yovani Gallardo (30.8%, 5.91 ERA). If any of those four might come at even a slight discount, especially in shallow leagues, now’s the time to strike. 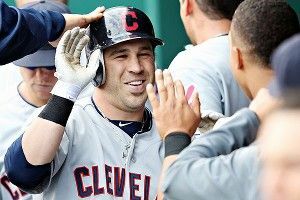 Meanwhile, our target hitter of the week is Jason Kipnis: .188/.257/.531, .136 BABIP. Despite the low batting average, Kipnis already has three homers and seven RBIs to go with six runs scored. He came into this season as a semi-popular sleeper pick, so it’s not like you’d get him at a huge discount. But at age 25, coming off a near 20-20 season between Triple-A and the majors in 2011, Kipnis might be worth considerably more than the best of the lower tier of second basemen — which is where he got slotted in most drafts this spring. Got a fantasy baseball question, query, or quandary? E-mail us at grantlandfantasy@gmail.com. We’ll use the best submissions for future mailbags.